WASHINGTON, Feb. 6, 2019 /Christian Newswire/ -- In last night's State of the Union address, President Donald Trump called on Congress to defend the dignity and life of America's unborn children and pass legislation to prohibit late-term abortion. In his strong pro-life message, President Trump said, "All children--born and unborn--are made in the holy image of God." The so-called "Reproductive Health Act," recently signed into law by New York Governor Andrew Cuomo, authorizes the murder of unborn babies up to the point of birth for any reason and revokes medical care for babies who are born alive after a failed abortion. In Virginia, the governor stated he would support executing a baby after birth. The Pain-Capable Unborn Child Protection Act was introduced in the U.S. House and bans late-term abortions nationwide after 20 weeks post-fertilization on the basis that the unborn child is capable of feeling pain. It would also require doctors to provide medical care to babies born alive during failed abortions. Sen. Patty Murray of Washington state blocked the unanimous passage of the bill. "I commend President Trump for his powerful pro-life message last night which further supports his leadership in protecting the precious lives of unborn babies in America," said Mat Staver, Founder and Chairman of Liberty Counsel. "President Trump used his State of the Union address to highlight the gruesome agenda of murdering babies most recently displayed in New York and Virginia. 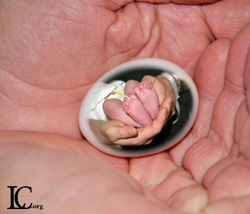 I am deeply moved to hear him say that 'all children-born and unborn—are made in the holy image of God,'" said Staver.